I've read a lot books about what it means to be a pastor, but few of them capture what it's really like. Instead they typically paint a picture of what pastors should be doing in an ideal world, and with a great deal of spiritual enlightenment. It's not that I don't enjoy reading these books, it's just that I generally feel chastened somehow while I am in the midst of them. I find myself wondering if I will ever discover the "secrets" that the author has discovered, and then be able to write my own sagacious pastoral book. So far, I have been unsuccessful in both arenas. 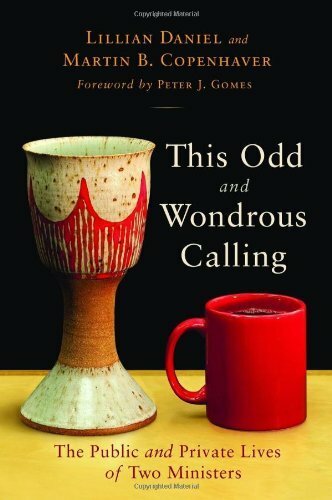 This Odd And Wondrous Calling: The Public and Private Lives of Two Ministers is a different sort of book about being a pastor. First, it's written by two very different pastors: Lillian Daniel, a thirty-something female pastor, and Martin B. Copenhaver, a sixty-something male pastor, who both happen to serve within the United Church of Christ. Second, This Odd And Wondrous Calling offers an authentic, "warts-and-all" portrait of what it means to be a minister, pastor, preacher, shepherd, chaplain... all of the many hats that one must wear when called to ordained ministry. This Odd And Wondrous Calling is structured almost like a conversation between Daniel and Copenhaver as they alternate essays---sometimes even addressing the same topic. The essays are beautifully written, revealing, honest and hit all-too-close to home for pastors. This Odd And Wondrous Calling speaks to issues that pastors both cherish and dread. It addresses questions of pastoral authority, learning to be vulnerable, preaching, leadership and even the role of the pastor's spouse. If you are considering entering into the ministry, this is a book you need to read. It's honest, forthright and gives you a clear picture of what it's like to struggle through the lows of being a pastor, and to celebrate the highs (but not too much, of course) when you experience them. It's also a book you need to read if you are already in the ministry. Sometimes it's just good to know that you are not alone in your feelings, trials, tribulations and experiences. I would also recommend this to lay people who would like to understand more about what their pastor may be going through. It would be a great read for a Pastor Search Committee or a church governing body.